A graphic designer and an IT worker form the unlikely pairing behind one of Tasmania’s newest breweries. 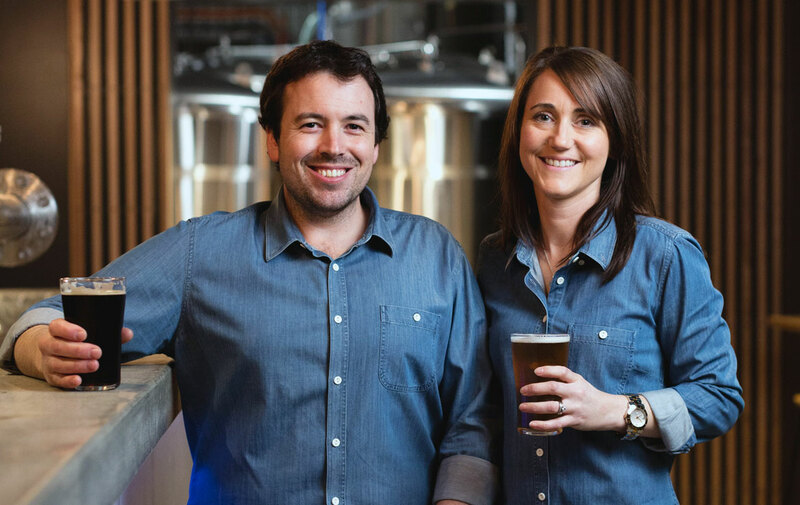 Carla and Tom Bignell recently opened the doors to T-Bone Brewing Company on the North Hobart restaurant strip. Situated just a couple of blocks up from Shambles and a couple of blocks down from The Winston, they're well placed to take advantage of the growing enthusiasm for craft beer in NoHo. Tom’s father Peter Bignell runs the Belgrove distillery at Kempton and, for the last two and a half years, T-Bone has been brewing from there. Their brewery arrived in Hobart from China in February 2016 and took three months to build. After working their way through a few language barriers – one of the two engineers who came to work on the installation didn’t speak any English – they got the equipment up and running and the focus turned to scaling up production on a system with some uniquely environmentally friendly features, of which more later.. While the cellar door has only been open for a few weeks, T-Bone has been brewing for six months at their new home, producing four core beers. The Choc-Milk Stout has been a hit from day one, perhaps down to its appealing name, maybe due to its smooth nature and delicious aftertaste. It’s a sweet stout brewed with lactose (milk sugar), and finished with cacao nibs and vanilla. The T-Bone Pale Ale is based loosely on classic American-style pales and is what the couple tags a "clean, crisp, crowd favourite". Then there's the Golden Ale, Carla’s favourite, which has a lovely, spicy and floral aroma, and Tom’s favoured choice, an IPA that, as you’d expect, delivers big hop flavours and a citrusy nose while remaining accessible. In addition to the core four, Tom has worked on a number of seasonals, including a Festival Lager for the Oktoberfest event at Hobart's Jack Greene earlier in the year and an autumnal pumpkin ale. When The Crafty Pint paid the brewery a visit, they’d just had 400kg of watermelons delivered in preparation for a soon-to-be-launched watermelon wheat beer – a prospect that has Tom and Carla looking slightly daunted. Tom and Carla at their schmick new NoHo brewpub home. Tom admits there have been challenges involved in the upscale and he has had a number of batches that have needed some tweaking. But he also confesses that it’s an enjoyable part of the process. Both Carla and Tom say it was the experiences they’ve had in Tasmania over the last few years – at events like the Hobart Twilight Market – that gave them the confidence to take the next step and open their own cellar door. 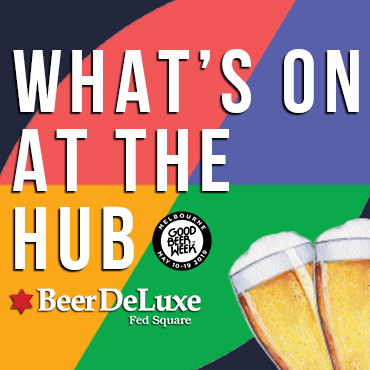 Now that T-Bone has opened its doors in Elizabeth Street, Carla and Tom are continuing to discover what attracts different drinkers to the venue and also believe the range of places opening up around the Tasmanian capital is helping to bring craft beer to new audiences. At this early stage, The Bignells aren’t offering a full food service at T-Bone. There are antipasto plates and a nearby Italian restaurant offers pizza delivery, but for now the focus is very much on the beer and the rather unique brewing processes. 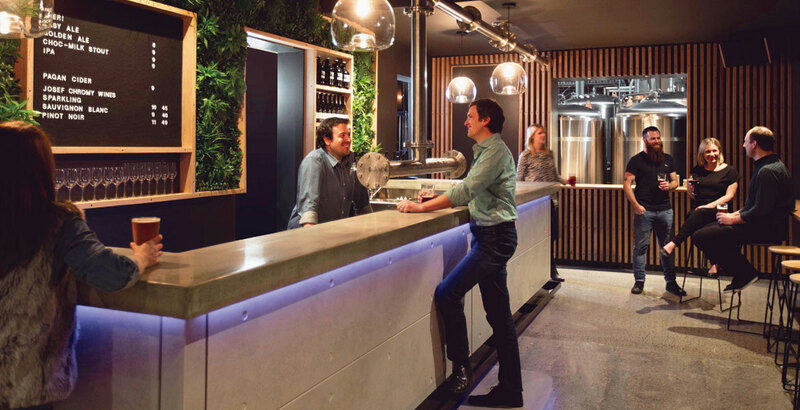 In an Australian first, the brewery runs on converted waste oil. It’s an idea Tom claims to have "stolen' from his father’s work at Belgrove Distillery. They collect used cooking oil from local sources, including one of the fish punts on the Hobart Waterfront, and run it through a converted diesel oil generator. 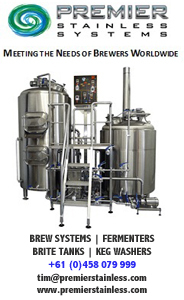 The resulting steam powers the brewery equipment. In another nod to sustainable business practices, and maintaining the connection with T-Bone’s Kempton roots, the spent grains from the brewing go back to feeding stock on the farm at Belgrove. The results of this unique brewery-distillery relationship will be available for tasting at a joint Belgrove and T-Bone Boilermaker event in January, where Peter and Tom Bignell will pair their beers and whiskies. It’s hard to see where the watermelon wheat beer might fit into that equation, but we hope to be pleasantly surprised. T-Bone beers are also available on tap at several venues around Tasmania and through the cellar door, where they offer growlers and refills. About the author: Ruth Dawkins is a writer who comes from a tiny island in the north of Scotland. She moved to Tasmania, where the cold winters, beautiful light and generous measures of whisky make her feel very much at home. She tweets as DorkyMum.